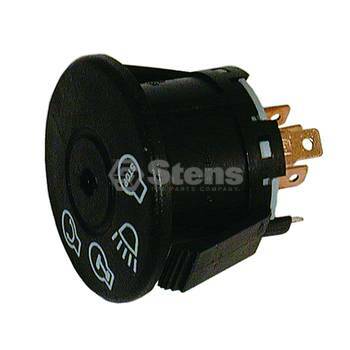 Ignition Switch / MTD 925-1741 Replaces MTD 925-1741, Murray 94762, AYP 175566, AYP 175442, John Deere GY20074, AYP 163968, MTD 725-1741, Husqvarna 532175566, Husqvarna 532163968, Murray 94762MA, Murray 94762MAX, Delta 6900-47P, Cub Cadet 725-1741, Cub Cadet 925-1741, AYP 583068901, AYP 532175566, Husqvarna 539107541 Fits Rotary 7015, Prime Line 7-01932, Oregon 33-376, Oregon 33-366, Dealer Choice 81-3000, Laser 97755, Laser 97871, NHC 263-5742, Ratio Parts 030-486, Sunbelt B160025, GHS 6824 Replaces John Deere 155C, L100, L105, L107, L110, L120, L130, G110, LY18 and some Scotts and Sabre models; MTD all auto drive step thru frame tractors 1999 and newer No. Of Terminals: 7, No. Of Positions: 4, Manufactured by Delta Systems Inc.